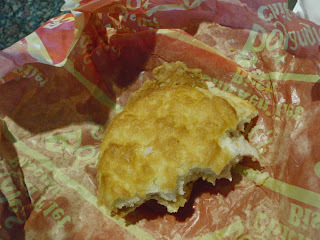 The next time you find yourself with a layover in Charlotte, NC, you should know that you can satisfy your Bojangles craving right there in the airport. Specifically, it’s located beside gate B11, and you’ll find fried chicken and biscuits waiting for you. I made a mad dash for the line as soon I got off the plane and ordered a Cajun Filet Biscuit and the largest order of spicy fries I could get my hands on. That was a very good day. Be advised that if you’re munching on some high-in-sodium snacks before you board your next US Airways flight, you’ll want to fill up that empty water bottle. They now charge you two bucks for beverages, including water. Coffee and tea can be purchased for one dollar, just in case you were interested. Otherwise you’ll find yourself stuck on a flight, parched and dehydrated, and willing to kill for just a sip of water, but finding that you’d rather die than pay for a tiny little bottle of airline tap water. (According to the NYT, if you want to argue with the flight attendant about the charge for drinks, they will more than likely attempt to placate you by giving the beverage away. I’m guessing flight attendants really dislike that publication right now.) Oh, and if you’re feeling especially classy, you can order a tiny bottle of merlot for a measly $7 (pocket change!) to go with your super fresh gourmet airline salad that also costs $7. That’s living life to the fullest. Alpha Cook would much rather hop a ride on a C-130, sit on a crate, and eat an MRE.